I have been back in New York two weeks now after living in the Dominican Republic for a year. While re-acclimating to the culture and the pace of life, and catching up with friends and family, it continues to amaze me how easy it is to do things (calling a cab, going to a supermarket etc) and everything is in English! For now I am living with my family, but I am planning to move into the city within the next few months. 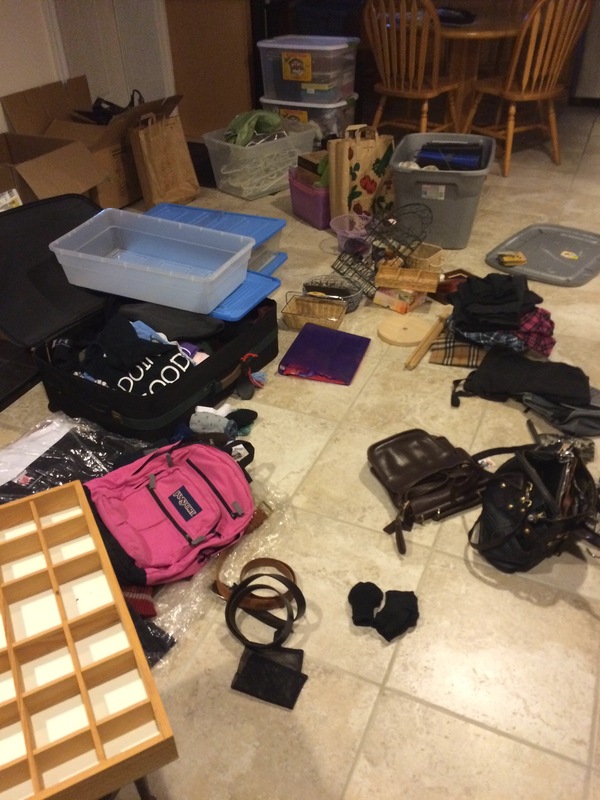 Crazily, during my first week back, I did a major purge. I had things at both of my parents’ houses that I hadn’t seen for a year. I had been living with only a few bags during my time abroad and I was able to function and dress myself every day. While I did pick up some household goods in the Dominican Republic, I left them all behind along with clothes and shoes I wouldn’t wear again. I also gave away all my books and school supplies. Knowing that I really did not need much to live comfortably, I was in the right mindset to overhaul everything I had collected (ahem, hoarded) in New York. 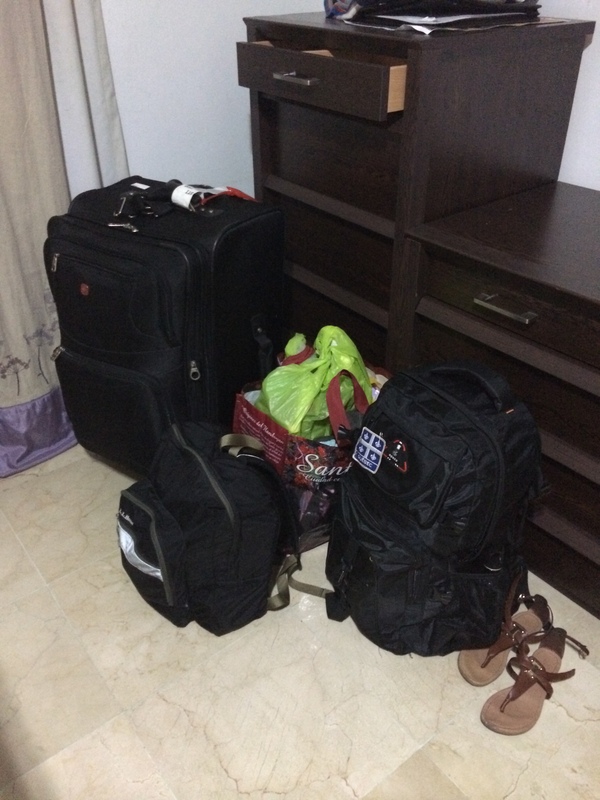 My possessions in the Dominican Republic after 6 months, before moving to a new apartment. To follow her method, I went through everything over the course of a few days, by category, then determined what to keep and what to eliminate. The goal was simple – get rid of as much stuff as possible. 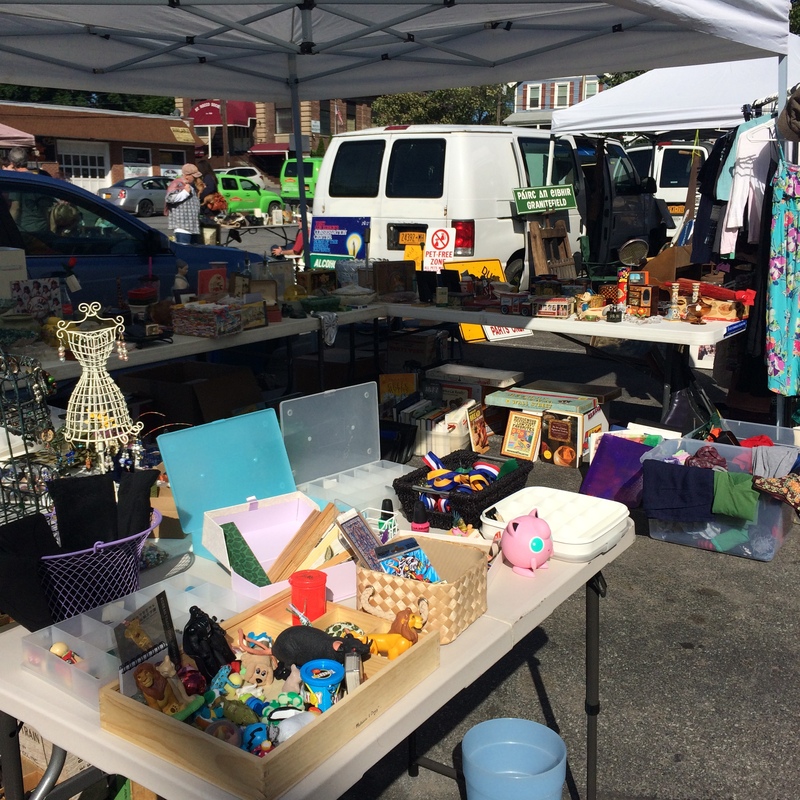 Additionally, my mother and I planned to sell everything at a local flea market the weekend after my return, so we worked together to fill as many boxes as we could. We donated what didn’t sell to Habitat for Humanity or Salvation Army. First, I went through my clothes. I got everything together and found plenty of things that I no longer wore. I had at least 10 pairs of pajama pants, way too many patterned shirts that I bought in college and were no longer appropriate for my current life style. Marie’s method of “Does it spark joy?” worked – I filled two huge bins with clothes to sell/donate. Worn out items will be placed in a fabric collection bin to be recycled. Now, all my clothes fit neatly in my little closet, and I have an enormous bin in the basement with my winter coats, sweaters and boots. 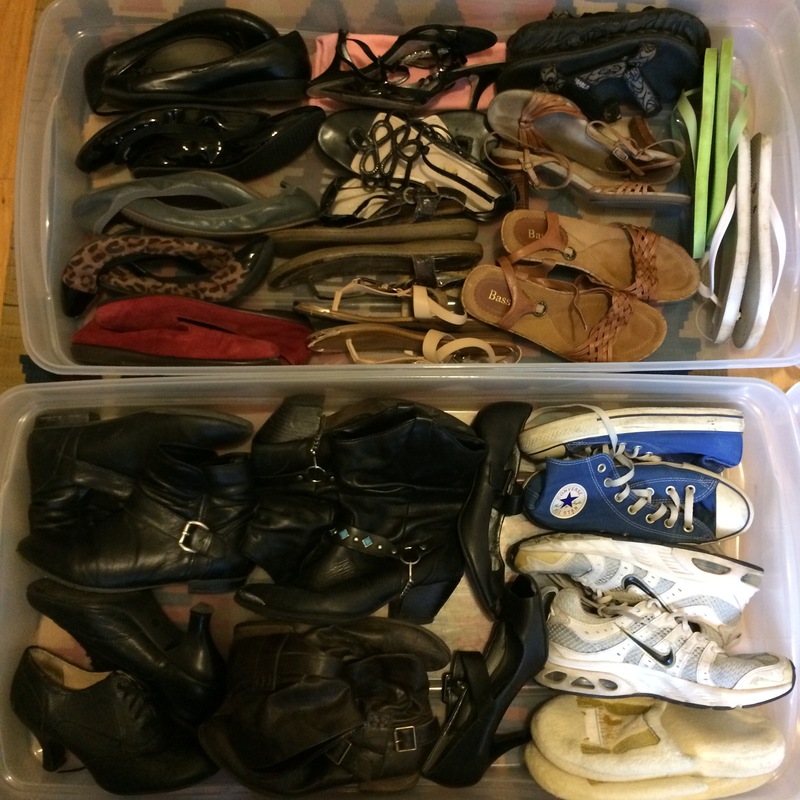 I couldn’t part with many pairs of shoes – with seasonal changes I don’t know what my new lifestyle will hold, so I kept two under-the-bed bins of shoes. a. Jewelry: I didn’t realize truly how much jewelry I had until it was all together. The hardest part was letting go of the many beautiful gifts that I have been given but I decided to put everything in a pile and only pick out what I was most excited to wear again. Everything was stored in boxes, so I bought a large jewelry box and arranged everything neatly. b. Bags: I did a bag purge before moving to the Dominican Republic so I only eliminated a few bags. I put the rest in a bin and sorted by size and color. In the Dominican Republic, I only brought one big and one small purse so I am reveling in my collection for the moment. They all bring me joy. c. Scarves: I absolutely love scarves. In New York, I wore scarves every day due to the casual dress code at my last job. Now, I am looking to dress more professionally and the scarves don’t fit in this mindset. Again, many scarves had been gifts so I had been holding on to them. I chose 7 to keep and put the rest in the bag to sell/donate. My huge book collection has been seriously purged. Cookbooks, gone. Textbooks, gone. I kept a few favorite childhood books (Alice in Wonderland, and a few girl-power books), and my yearbooks. I can always buy a book online or go to a library if I want to re-read something. a. 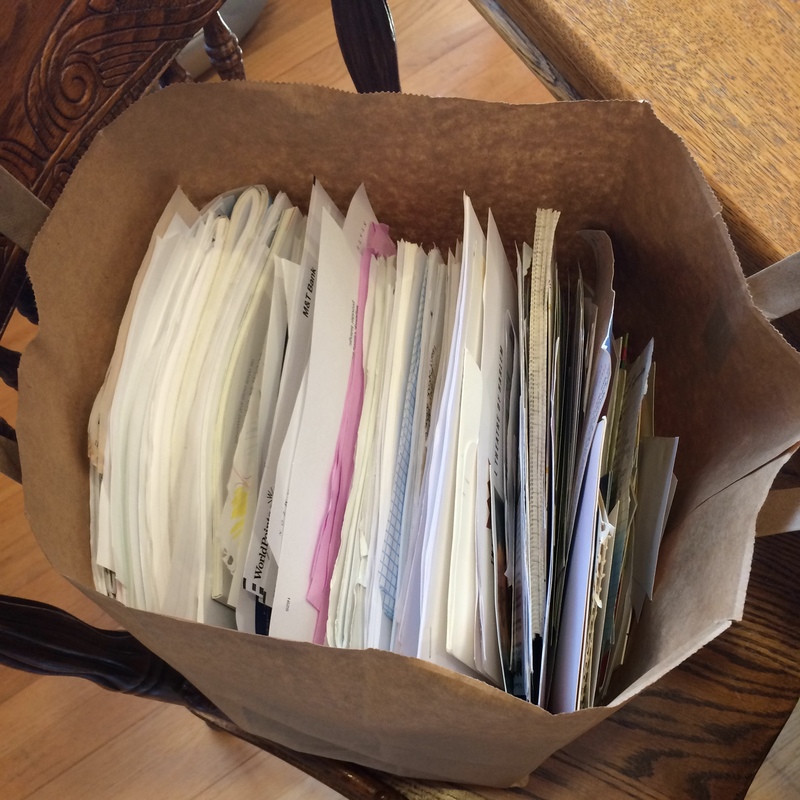 Papers: I thought I had done my purging before the move, but I was wrong. Class notes, programs from musicals, old cards from family and friends… Marie Kondo says to get rid of it all. I read through the notes one more time and kept only a few that really were meaningful or very important documents or records. The rest, recycled! In total I filled four huge paper bags with recyclable material. b. Household and Decorative: I haven’t gone through my household items yet, such as kitchenware and bedding, as I am waiting until I move to a new apartment. However, I eliminated many decorative things that I had been holding on to for sentimental reasons, but kept a few things that I know I will appreciate in a future home. c. Collections and Toys: I used to collect random things like buttons, small decorative boxes, ceramic animals, and decided to eliminate it all. Challenges: Getting rid of sentimental things. Many articles I read rang true: people enjoy giving gifts and don’t remember what they have given you. It is OK to give away those items if they aren’t bringing any more value to your life. Successes: Fitting everything neatly in my closet. 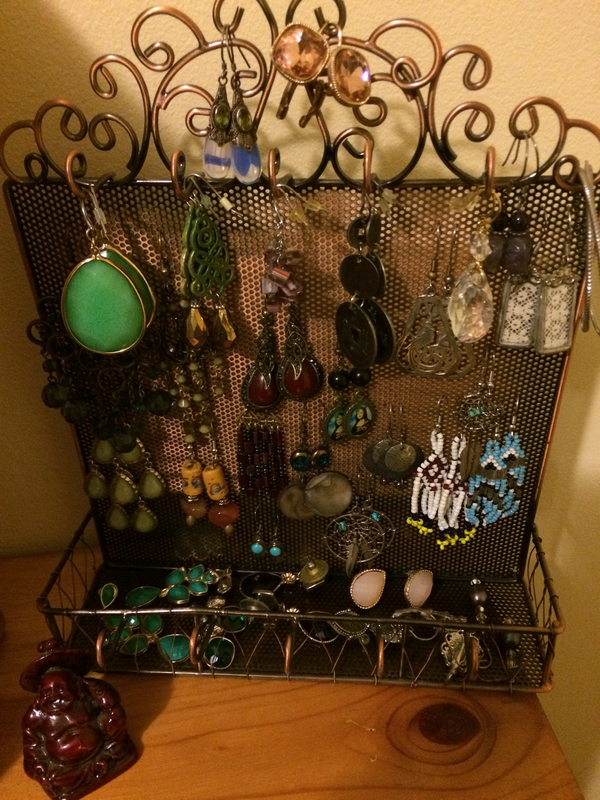 Organizing all my jewelry and liking EVERYTHING! 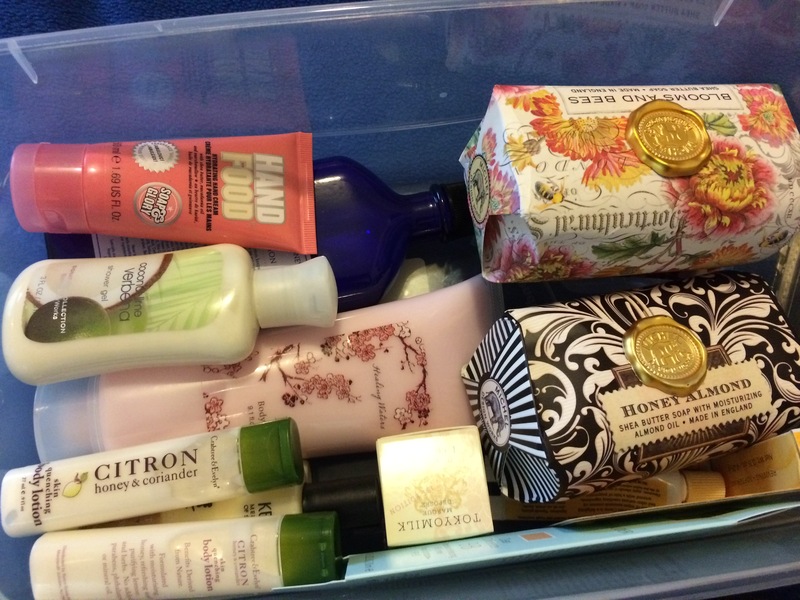 Marie Kondo’s idea that you don’t need to buy new organizational boxes or anything is correct. I already had everything I needed. 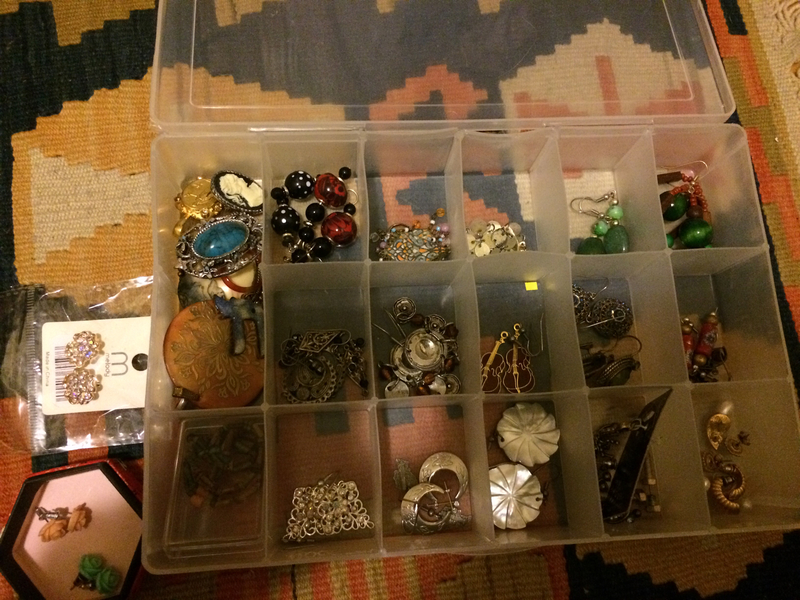 The only thing I bought to help me organize was a jewelry box my necklaces and earrings. And finally, knowing that I could make a few dollars off these things and then donate the rest to good organizations was also inspiring. 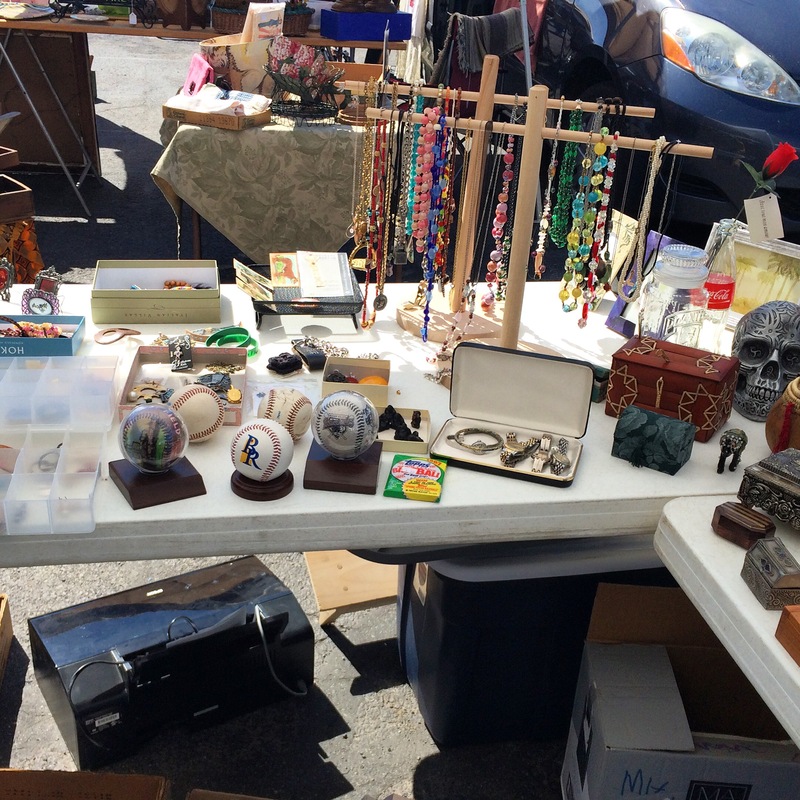 My mom and I had a successful day at the flea market. Together, we made about $400! She sold antiques and home goods, and I sold tons of jewelry, toys and accessories. The rest we boxed up and brought to Habitat for Humanity. We had an entire car full. It felt great to drop it off at their Restore, knowing that the items sold would contribute to a great organization. Overall the process was a success. I still have a fair amount of bins at both parents’ houses, but now I know where everything is, and it’s ready to go when I move to my own place. 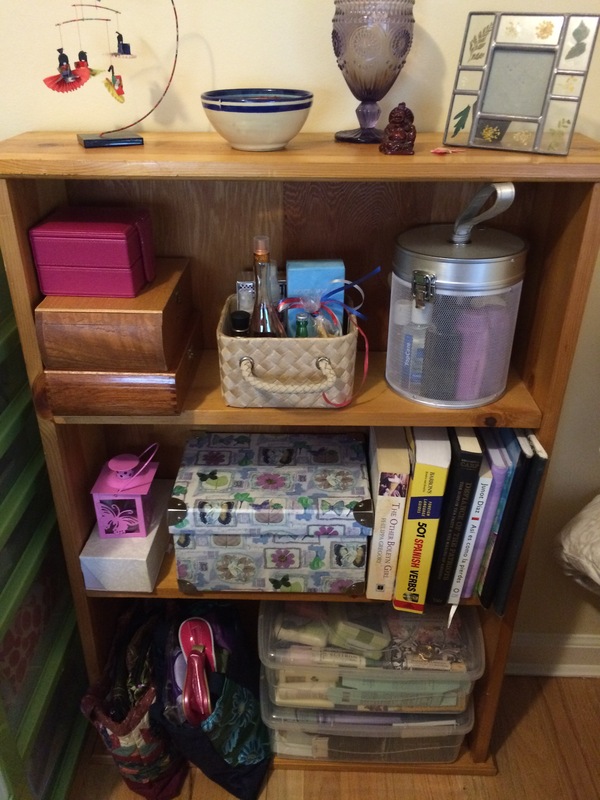 The final result: a beautifully organized bookcase!